With a house built in 1929, there is always something that desperately needs some sort of renovation. Jeff and my catch phrase has become, "Add it to the list," because we absolutely need to keep a running tab of all the home improvements that must be done to make this house, well, liveable. Rather than weekly dinners out at fun restaurants, our life has become weekly, bi-weekly, and even tri-weekly trips to Lowe's and Home Depot to buy all those "fun" supplies for the home. Both of these stores, due to their hardware nature, allow dogs inside, so the Milt is a good tag-along. If I need to make one of these trips, I always time it for a day that the Milt has stayed home, so he can come along for the ride and keep his Momma company. Well, what are a few of the things on our to-do list? Why ever am I drying all of my clothes outside, you might ask, especially since Pop spent 20+ hours enlarging our wash room last weekend? Well, after all that hard work, our dryer has ceased to work. It up and died on me Friday night just when I needed it to dry a whole heap of clothes. How did this tragedy occur? We believe the dryer was broken in transit during our move, and I still hold out hope that it is a voltage problem that we can look further into this upcoming weekend. Until then, we are letting it all hang out, all over our porch. Trashy, I know. At least it's not our front porch. Another big ticket fix-it item is our fence. It has multiple gaps and holes that we think Milt is a little too big to squeeze through, but with the proper motivation, anything is possible. Actually, in the area shown below, our doodle can navigate the tiny crawl space between our dilapidated fence and our neighbor's to run the gauntlet up and down pretty far back. Now that's a problem right there. Pop, our "Handy Man" will actually be back this upcoming weekend to construct a brand new fence with my Jeffery. 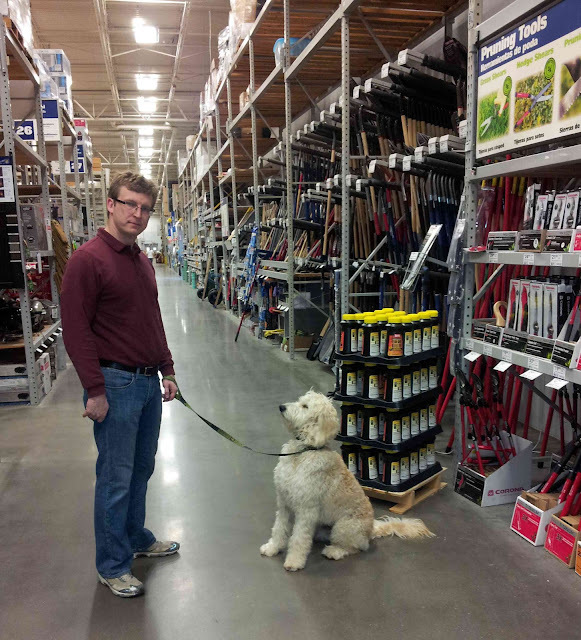 This fence has been a top priority for Jeff, especially for security reasons. It is a little too short to keep out intruders, and let's face it, anyone can simply squeeze on through. The gate into our driveway is also a chain link fence that swings back and forth, directly by our bedroom, so we are a little bit leery of it as well. Fence building, in particular the 8-foot one Jeff and his dad plan to resurrect, will undoubtedly be a tremendous project, costly in time, labor, and money, but we got to do it. Next this is my pet peeve that I would really, really like to see fixed. That is our pull-down staircase entrance to the attic that is absolutely not flush with the ceiling. I have declined to enter the attic because Jeff has sighted multiple cockroaches (two to be exact!) up there. I have spied a rather large one (I bludgeoned it to death again and again and again) just under this pull-down apparatus, so I am quite confident that cockroaches can fly down from above. This is a top priority for me but a low one for Jeff. Growing up in Louisiana, Jeff is a lot less squeamish than I am at the sight of the nasty, little buggers. 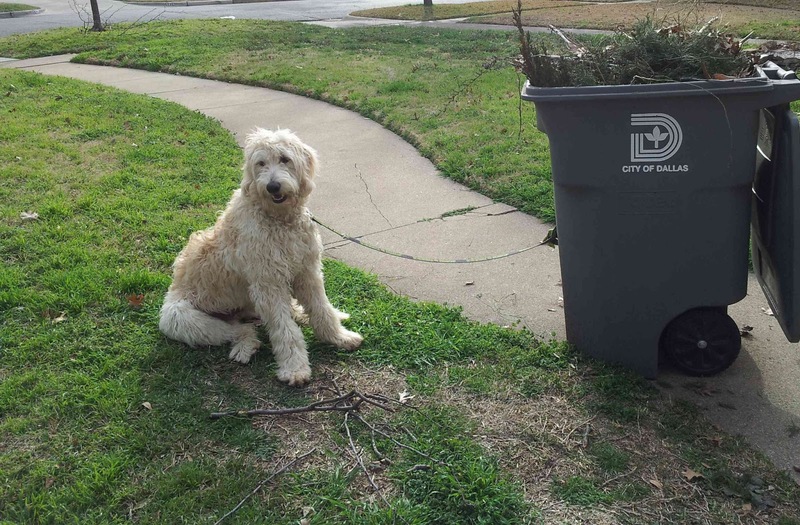 While raking, our dood always joins in the fun! After we raked the leaves out, Milt discovered a lot of cool dark dirt underneath! Palmetto bugs are NOTHING to scoff about. You are so much more brave than I bludgeoning it to death; I would have run from the house screaming like a girl! And I totally understand your pet peeve with that attic door. Hey, I watch scary movies! 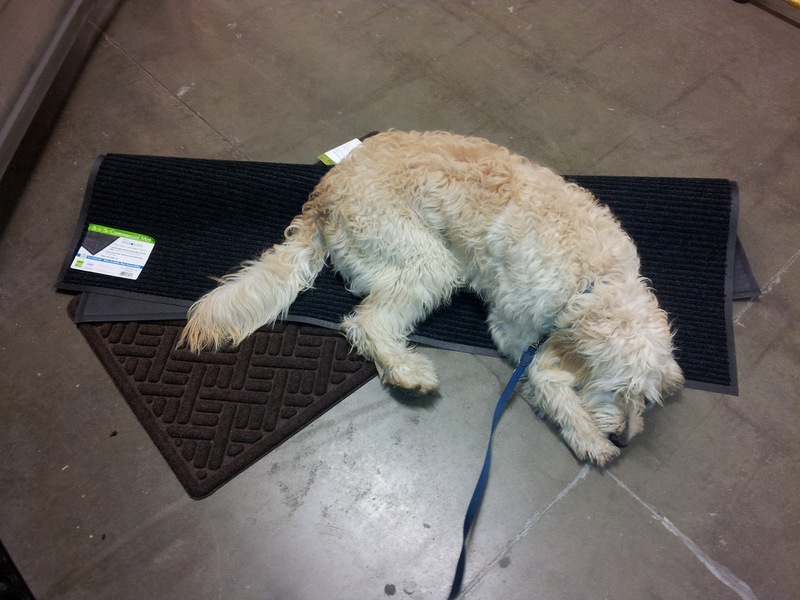 I love that The Milt goes with you to Home Depot and helps pick out supplies for the house.....testing out rugs....adorable! Lots of projects do tend to wear you down, but at the same time, you are making that house your very own sweet home. *\0/* Yaaaaayyyy!!! Lucky Milt to go on so many outings and find cool dark dirt! !